Despite their reforming zeal, the heroes of this Parliamentary term have not been government ministers, or the opposition. Nor has it been big business or the financiers that support them. The real heroes have been the entrepreneurs: taking risks, starting businesses, creating jobs. Entrepreneurs are not only driving growth, innovation and job creation; they’re also among the nation’s best problem solvers. Baroness Lane Fox’s role as UK digital champion has revolutionised the government’s approach to digital services, cutting costs and improving government interactions for the public and businesses alike. Unleashed on public sector procurement after the government removed layers of bureaucracy, entrepreneurs have slashed costs and driven innovation, delivering much more for far less than the large-firm incumbents. In fact, entrepreneurs have worked hand-in-hand with government to design high impact policies across a range of areas: from SEIS tax breaks and graduate entrepreneur visas, to Start Up Loans and Entrepreneurs’ Relief reforms, as well as many other contributions. Yet this entrepreneur-led recovery must be protected. 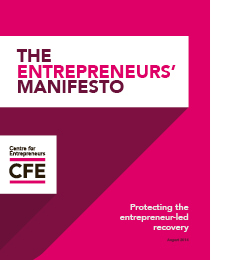 For Britain to achieve sustainable growth, it’s essential that all political parties commit to supporting entrepreneurs, maintaining proven entrepreneurship policies, and, most importantly, work with entrepreneurs to improve business policies and to help solve wider government and societal challenges. This Entrepreneurs’ Manifesto is different to the many other manifestos currently being rolled out. First, we celebrate the value of entrepreneurs to the UK. Second, we defend existing, proven entrepreneurship policies that must be maintained. Third, we present an amalgamation of own our ideas as well as those submitted to the Centre from real entrepreneurs and other bodies. Politicians take note – the voice of the entrepreneur needs to be heard.